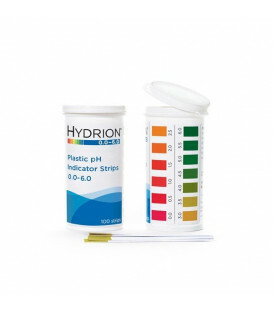 pH Test Strips are a short range highly accurate way for testing the pH of both urine and saliva. 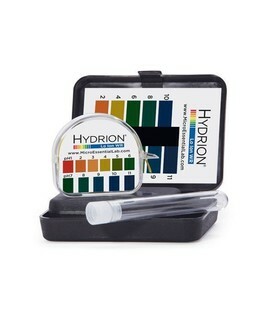 Simply match the colour change to the included colour chart for your pH reading. These kits offer you an easy to read, single colour match at every .2 to .3 interval from pH 5.5-8.0. Instantly compare the resulting colour with the matching pH colour chart. 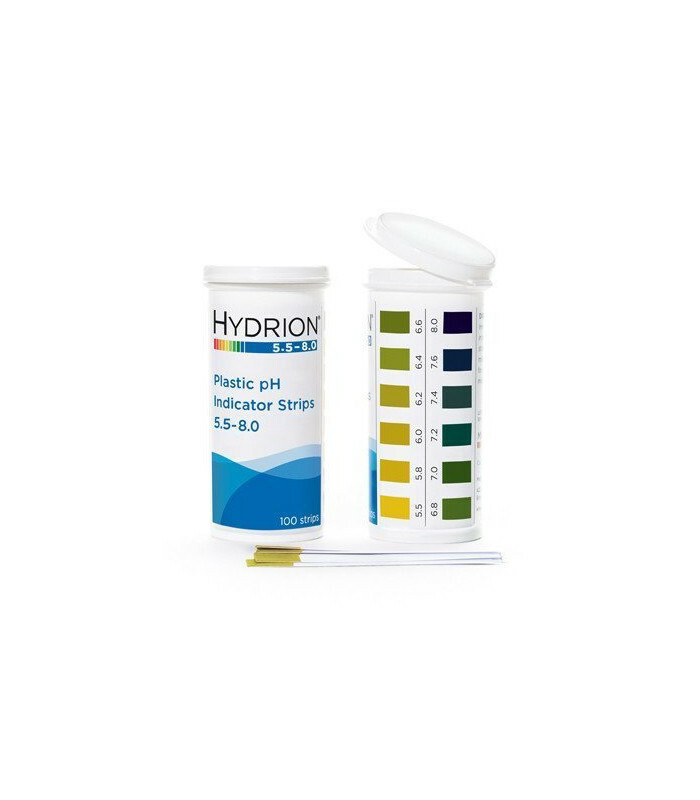 Midstream*, quickly wet the pH plastic strip with your urine flow. 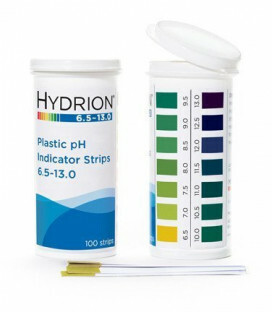 Immediately compare the colour of the plastic strip to the pH colour chart. 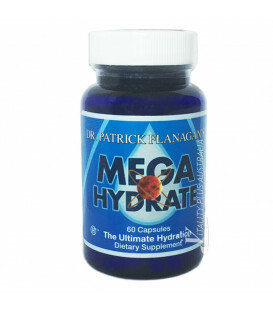 Alternatively, collect midstream* urine into a glass or jar, and dip your pH plastic strip into the urine. 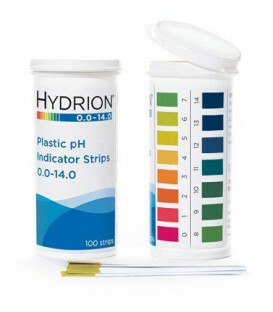 Immediately compare the colour of the plastic strip to the pH colour chart. Upon waking, before you drink water, tea, coffee etc., have your pH plastic strip ready and swallow whatever saliva is in your mouth. Draw-up fresh saliva and then swallow. Do this two times. When you draw up saliva for the third time, spit this saliva onto a spoon and quickly dip your pH plastic strip into the spit. 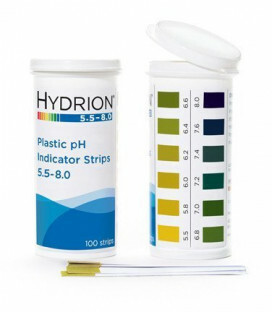 Immediately compare the colour of the pH plastic strip to the colour chart. The same process applies if measuring throughout the day. Super-sensitive pharmaceutical grade Hydrion diagnostic pH testing strips give you an accurate reading of how acidic or alkaline your tissues really are. Approximately how many tests per vial are there? There is 100 test strips per vial. Material Plastic strips lined with pH paper for ease of measurement. Conveniently packed in flip-top vials, these premium quality, close-range plastic strips offer clear, bright single colour matches. I didn't know one colour strips existed until I found your site. Measuring my pH levels is a priority to help me know what foods to eat. 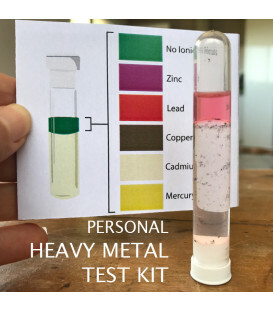 I tested the strips by haviong a cola once and a couple of hours later my pee was very acidic so now I don't buy soft drinks. This is the first time I've used your testing strips and I will be continuing to use them. The old ones I used had so many colour matches to match it was always very confusing. Thank you also for your prompt service. It was much appreciated.